2,426 new social homes are to be delivered in Kildare over the next three years. This is the fourth highest target in the Country after Dublin City, Fingal, and South Dublin. Today in the Dail I had the opportunity to discuss Project Ireland 2040 and outline the key projects included that will benefit Kildare. Fine Gael Kildare South TD Martin Heydon has welcomed Housing Minister Eoghan Murphy to Athy this morning where he officially opened the new Family Hub to be run by Peter McVerry Trust. 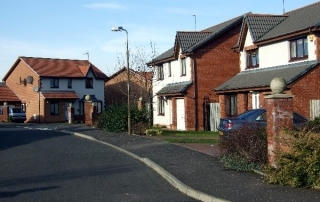 The 7 family unit hub have been developed in the former priory on the old Dominican site. 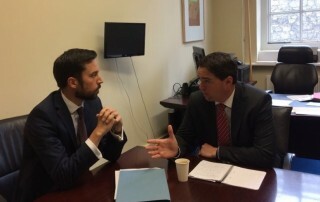 Kildare South Fine Gael TD Martin Heydon has met with Minister for Housing Eoghan Murphy to push for publication of the “Framework for enhancing fire safety in dwellings where concerns arise” report commissioned following the fire in Millfield, Newbridge. The report includes a case study on Millfield as part of it. 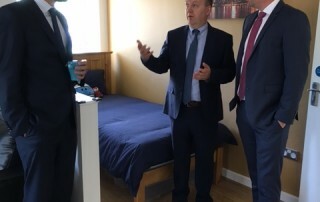 Fine Gael Kildare South TD Martin Heydon has today (Tuesday) said that Housing Minister Simon Coveney has confirmed funding of €515,000 towards the development of homeless accommodation at the site of the former Dominicans Priory in Athy. 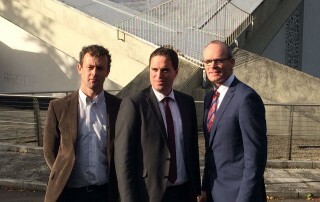 Fine Gael Kildare South TD Martin Heydon recently welcomed Housing Minister Simon Coveney to Athy to get an update on progress of the re-development of the site of the former Dominicans in Athy.